1. 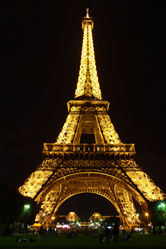 Visit at Night - The Eiffel Tower is a must-see anytime, but there is something magical about visiting the Eiffel Tower at night. Riding up the Eiffel Tower at night, looking out over the streets of Paris, you'll see why Paris is known as the "City of Light." At street level, seeing the spotlight on the top of the Tower zoom across the Paris skyline, and the reflection of the Tower in the Seine are sights not to be missed. An added bonus is that the lines are much shorter in the late evening, than in the afternoon. 2. 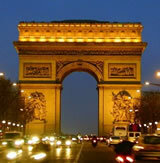 Walk to the Tower from the Trocadéro - The closest metro stop to the Eiffel Tower is Bir- Hakeim. You walk a few blocks, round a corner, and you're at the base of the Eiffel Tower. For a truly memorable stroll to the Eiffel Tower, try this approach. 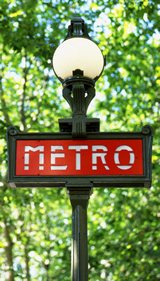 Ride the metro to the Trocadéro station. 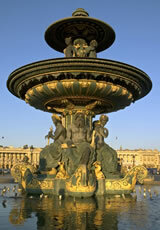 Walk up the steps to the Palais de Chaillot, which houses theaters and a few museums. On the large, marble plaza, take in the spectacularly stunning view of the Eiffel Tower across the Seine river framed by the fountains in the Trocadéro gardens. Time your visit, so that you are standing in the Plaza at the top of the hour when the Tower turns on the "sparkles" for five minutes. Continue walking towards the Eiffel Tower, through the gardens, and over the Pont d'Iena bridge to the base of the Eiffel Tower. For kids, take a spin on the antique carousel. For lovebirds, sneak a kiss on the benches scattered through out the Trocadéro Gardens, known as the Parisian version of Lover's Lane. 3. 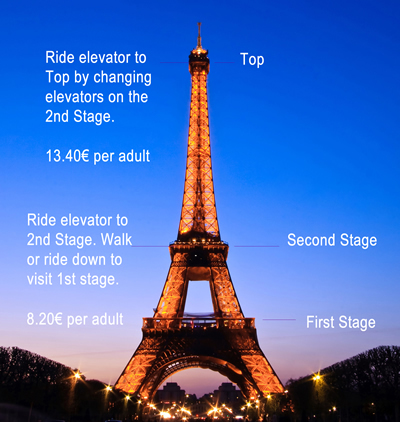 Buy Your Ticket in Stages - Most people buy a ticket to the top when they enter the Eiffel Tower. If you are short on time or patience, you may want to only purchase a ticket to the 2nd stage. The best views of Paris are on the 2nd level. You are high enough up to see the stunning panorama of the Paris skyline. 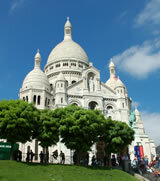 Yet, not too high, so that you can easily recognize most Paris landmarks without using a map. At the 2nd level, you can decide whether or not to take the elevator to the top. 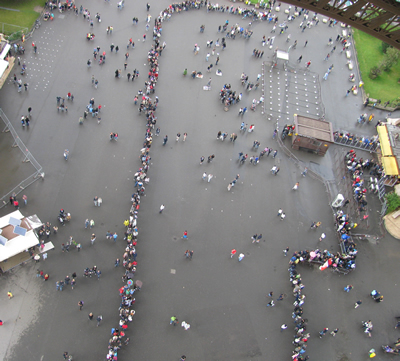 If the lines to the top are outrageous ( a wait of of a few hours in line for the elevators to the top is not uncommon) or the weather is not cooperating (wind and rain obscuring the view), enjoy the view on the 2nd stage. If you decide to ride to the top, simply buy your ticket on the 2nd stage at the automated ticket machines or at the ticket counter. Then, follow the signs to the elevator line for the ride to the top. To check most recent rates, including reduced fees for people with disabilities, children and young adults under age 24, visit the Eiffel Tower rate page. 4. Purchase Your Ticket in Advance Online - Bypass the notoriously long ticket lines at the Eiffel Tower by purchasing your tickets online from the Eiffel Tower website. Avoid the long lines that wrap for hours around the Eiffel Tower by buying your ticket online at the Eiffel Tower website. You'll pick a time to visit, then select whether to print out the ticket or display it on your phone or iPad - a convenient option if you buy your tickets in Paris without easy access to a printer. 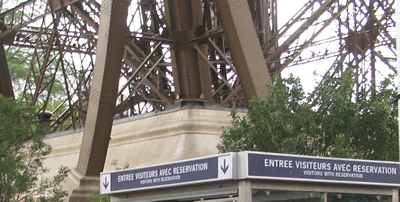 When you arrive at the tower, look for the signs for "Entree Visiteurs Avec Reservation" (Visitors with Reservations). If you are unsure of where to go, ask the Eiffel Tower attendant standing at the entrance to each line to point you in the right direction. If you have an e-ticket, bypass the lines and look for "Entree Visiteurs Avec Reservation." 5. Don't Bring Valuable Objects with You - Before entering the Eiffel Tower, your bags will be examined by a security officer. If an item you are carrying sets off the metal detector, the officer will confiscate it. We've stood in line for hours behind people who, instead of relinquishing an object with sentimental value, like a favorite hair brush or lipstick (we have no idea why these set off the detector), exited the line and missed their chance to go up the Eiffel Tower. 6. Have Drinks and Snacks at the Eiffel Tower - If you're like us, after an exciting trip to the Eiffel Tower, you'll be ready to rest your legs and have a relaxing snack and a drink in a Parisian cafe. The question is: Where are all the good cafes? Around the corner on the Quai Branly towards the Bir Hakeim metro are a few cafes that cater to tourists. The atmosphere, service and high prices leave much to be desired. The only interesting thing about these cafes are the number of different languages that are displayed on the outside menus. Across the Seine in the Trocadéro area, there are many elegant cafes crowded with the rich Parisians that live in this area. The ambiance is great, but the prices are in the stratosphere. After much trial and error, we've found the perfect place to for a break is on the Eiffel Tower itself. Located on the 1st and 2nd floors are the Eiffel Tower Snack-Bars where you can purchase a sandwich, a slice of pizza, or a pastry for prices comparable to the tourist-cafes on the ground. For example, 2€ for a Pain au Chocolat (chocolate croissant), 4.50€ for a Ham and Cheese Baguette, and 4€ for a glass of wine or beer. 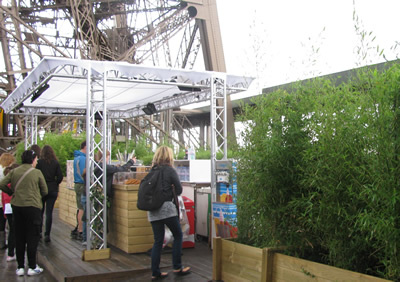 Choose a snack, then pick a secluded seat among the foliage with a view of the stunning Paris skyline. On the top of the Eiffel Tower, share a festive moment with a glass of bubbly at the Eiffel Tower Champagne Bar. 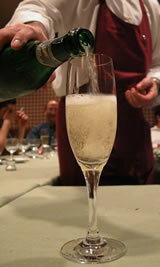 Glasses of champagne range from 10 to 15 euros. 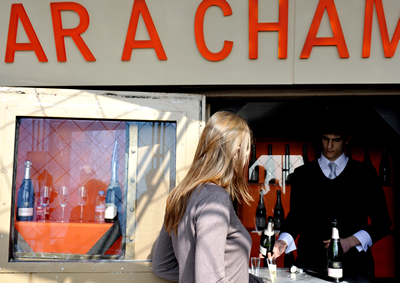 Sip a glass of champagne and enjoy the panoramic view over Paris. 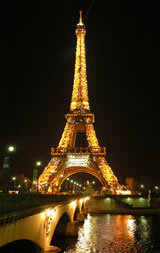 Photo courtesy of the Eiffel Tower website.